Kamado Grills are versatile enough to allow you to grill, smoke and bake great tasting food, all on one grill. They use a simple design that has stood the test of time so use these easy tips to keep your kamado grill in top shape for years to come. 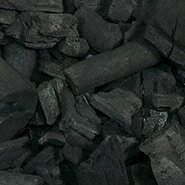 Lump Charcoal - Use only 100% natural hardwood Lump Charcoal. Briquette charcoal has additives that will emit odors and can be absorbed into the ceramic. Lighting – There are many acceptable methods to light your charcoal, such as a charcoal chimney starter, an electric starter, or branded firestarter cubes/matches. Never use lighter fluid! Never Use Lighter Fluid – Lighter fluid contaminates your kamado with chemicals which can be absorbed into the ceramics and affect the taste of your food. Flashbacks - To prevent a flashback, use a method known as burping – just open the lid just a few inches and pause to prevent a flareup. Removing Ash - Since natural lump charcoal produces a small amount of ash, it is recommended to remove it after each use. Use the ash tool to stir up the remaining charcoal in the firebox to remove the lose ash. The ash will fall through the grate for easy disposal. Cleaning the Grill (Exterior) - From time to time, you'll want to clean the exterior of your grill. Use a solution of mild detergent and water or glass cleaner with a clean cloth or paper towel to remove dirt and grime on the ceramics and hardware. If surface rust appears on unfinished hardware, use a steel wool pad to remove it. 1) Heat the grill to +600 for 30 minutes and allow the grill to cool completely. 2) Remove the internal components of the grill. 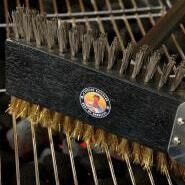 3) Use a soft bristle brush to brush the interior of the grill. 4) Remove the residue that collects in the bottom of the grill. 5) Insert the internal components. Tip - When your heat deflectors get dirty during normal use, just flip them over with the dirty side down for the next cool and the heat from the fire will self-clean that side of the plate. Tightness of the Band- Periodically check the tightness of the band that holds the base and lid together. Tighten the nuts until there is a good amount of tension. Do not over tighten. Replacing the Gaskets - Over time, the gasket material where the base meets the dome will degrade. Depending on the amount of cooking you do, it may need to be replaced every few years. To replace the gasket, purchase a gasket replacement kit and follow the instructions. Extended and Off Season Storage- To protect your grill for extended periods of non-use, a grill cover is recommended for both indoor and outdoor storage. 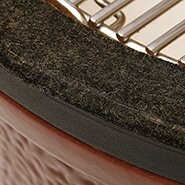 If you would like to learn more about the different types of kamado grills and how they compare to each other, please visit our Kamado Grills Comparison Chart. Read more articles by Chef Tony Matassa, ShoppersChoice.com, LLC.